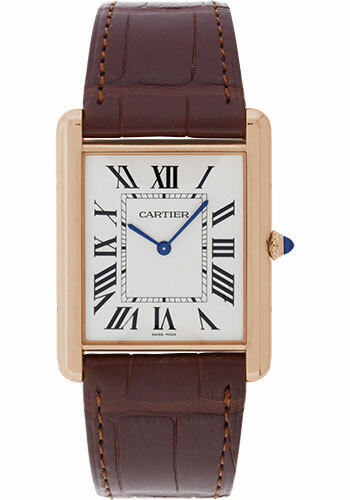 Extra large size (40.40mm x 34.92mm) 18K pink gold case, beaded crown set with a sapphire, mineral crystal, silvered grained dial with Roman numerals and sword-shaped blued-steel hands, manual winding caliber Cartier 430MC movement, brown alligator strap. Water resistant to 20 meters. Extra large size (40.40mm x 34.92mm) 18K pink gold case set with brilliant-cut diamonds, beaded crown set with a brilliant-cut diamond, mineral crystal, silvered grained dial with Roman numerals and sword-shaped blued-steel hands, manual winding caliber Cartier 430MC movement, brown alligator strap. Water resistant to 20 meters. Extra large size (40.40mm x 34.92mm) rhodiumized 18K white gold case set with brilliant-cut diamonds, beaded crown set with a brilliant-cut diamond, mineral crystal, silvered grained dial with Roman numerals and sword-shaped blued-steel hands, manual winding caliber Cartier 430MC movement, black alligator strap. Water resistant to 20 meters.